Dad of Divas' Reviews: Book Review - Sometimes I'm a Monster! This is a book that every child (and every parent) can relate to. The four children in Sometimes I'm a Monster! demonstrate the timeless lesson that no child is perfect. In these warmly illustrated pages, the children all have moments when they are little monsters who play wild games, push and shove, and simply drive the grown-ups mad. These same children are also the angels who are very kind to friends, sit and learn quietly, and say "please" and "thank you." The bottom line? Every child has moments when they may be a little monster. At the end of the day they are still the angels their families love so much. Color illustrations on every page. Any parent can provide many examples of their children being both angel and monster - sometimes one more than another. This book brings forth some great examples of both angels and monsters and gives all who read a fun story to share. 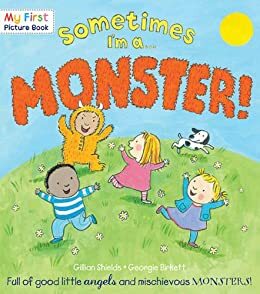 In the end though I love that the book ends on a good note and shows that even though our children can be monsters in the end they still are our little angels!